Understand the different reasons to integrate Salesforce and Heroku. Describe the methods for integrating Salesforce and Heroku. 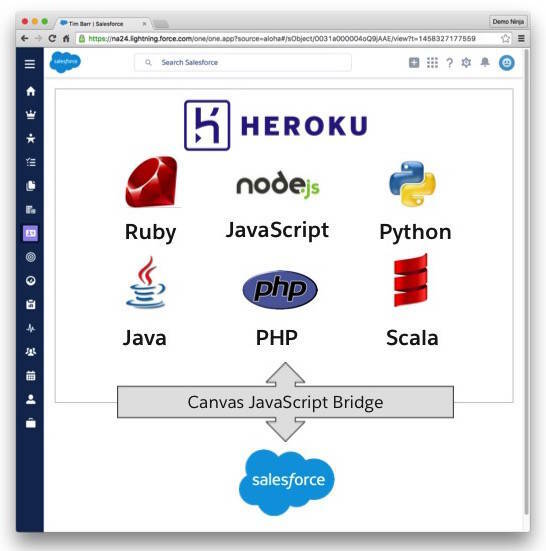 As a Salesforce developer you know that Heroku provides a great place to run apps that integrate with Salesforce for a variety of use cases. But what exactly are those reasons and what are the best methods for integration? Read on and your questions will soon be answered. Modern enterprise systems are composed of many different parts with different interfaces for a variety of types of users. These interfaces often pull together data from a variety of data sources. The microservices architecture has emerged as a way to decouple the pieces of a system into more easily maintainable, independently deployable services to provide endpoints that bring disparate systems together. Heroku is a great place to run apps and microservices that you can use with Salesforce through a variety of integration methods. We look at each one in more depth later on in the module. For instance, let's say you're selling inflatable unicorn party hats. Salesforce is your system of record for product information, such as pricing and inventory, with a public website built with Node.js, Rails, Java, and so on. The website uses that data to display availability and provide ordering functionality. With the public web application running on Heroku, it makes sense to replicate the product information to a datastore on Heroku so that it can handle a massive number of requests with low latency. For example, if users of the public site can "like" a product, you can use data replication to propagate the number of likes back to Salesforce for the marketing team. Data proxies aggregate different datastores, but unlike data replication, the data isn't copied. The data can be read only on demand. This approach enables data science, business intelligence, reporting, and dashboarding tools to collate data across multiple datastores without worrying about data synchronization challenges like storage and staleness. You can integrate legacy systems and external systems through data proxies to provide data to Salesforce, or Salesforce can provide its data to other external systems. If a Salesforce user needs to run inventory reports that correlate product data in Salesforce with warehouse data from an external system, data proxies can provide that information without using slower methods like extract transform and load (ETL). When the report is run, Salesforce fetches the necessary data from the external system without ever storing the data. The same also works in the opposite direction — an app running on Heroku is a data proxy for Salesforce to another system providing a security and transformation layer. We'll touch on that shortly. For example, a company that uses Salesforce for CRM acquires another company with a custom system built in Java. An easy first method of integrating those systems is simply to run the Java system on Heroku and render it in Salesforce. Running the Java system on Heroku can alleviate the scaling and ops burdens while standardizing on a deployment architecture for custom systems. 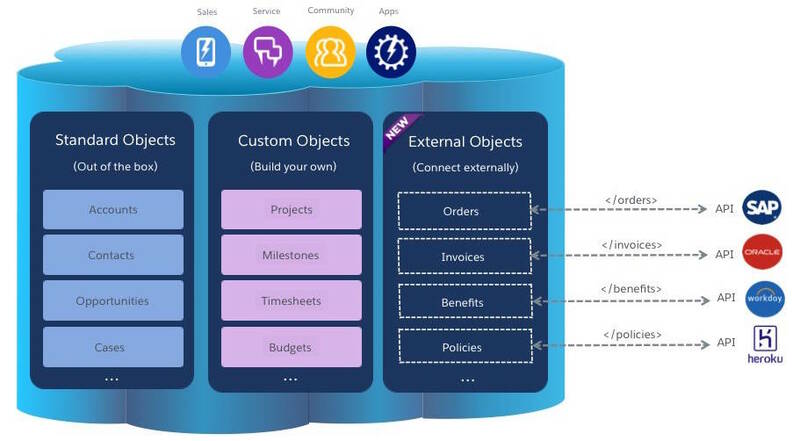 Standalone user interfaces that run on Heroku and integrate with Salesforce data can provide back-office extensions to Salesforce as well as customer-facing web and mobile apps. Custom user interfaces might have libraries, features, or developer skillsets that drive the decision to use Heroku and open-source technologies over the native Force.com options. As an example, let's say your real estate company uploads photos for each house it lists for sale. These photos are huge, so you need a way to resize them to reduce loading times and storage costs. You can easily offload this job to an external process on Heroku. Each time a photo is uploaded to Salesforce, it is sent to an app on Heroku for processing, and the resized image is saved back into Salesforce. The app on Heroku that handles the external process could be responsible only for that one piece of the system. In that case, the app is likely considered a microservice that can be deployed separately without any other system dependencies. We'll dive into each one shortly, but here's a quick overview to get you started. Heroku Connect provides both data replication and data proxies for Salesforce. Data replication synchronizes data between Salesforce and a Heroku Postgres database. Depending on how it's configured, the synchronization is either one way or bidirectional. To get hands on with Heroku Connect, check out the Quick Start: Heroku Connect Trailhead project. Heroku Connect also provides a data proxy to Salesforce through the OData protocol using Heroku External Objects. Heroku External Objects provides an OData wrapper for the Heroku Postgres database that Heroku Connect maintains a connection for. This feature allows other web services to retrieve data from within the specified Heroku Postgres database using RESTful endpoints generated by the wrapper. The primary benefit of Salesforce Connect is that it brings external data into the Salesforce UI and makes it look as if the data resides in Salesforce, although it's just proxied on demand from an external data source. This process makes it easy to collate disparate data sources for Salesforce users. Each Salesforce and Heroku integration method has a place depending on developer skillsets and the use case at hand. Here are some basic differences between the integration options. To embed a custom UI from Heroku (or other external web app) into Salesforce, use Canvas.